L Henry. Nonsurgical Spinal Decompression Of Lumbar Disc Herniation: A Case Report And Proposed Multimodal Chiropractic Treatment Approach. The Internet Journal of Chiropractic. 2015 Volume 4 Number 1. Introduction and Objective: This report describes the care of a 59-year-old male with a 16 mm L3-L4 disc herniation compressing the right side of the thecal sac and right L4 nerve root using nonsurgical spinal decompression as part of a multimodal chiropractic treatment plan. Nonsurgical spinal decompression is an emerging treatment for neck or lower back pain and radiating symptoms due to disc bulges, herniated discs, degenerative disc disease, radiculopathy and facet syndrome. Decompression devices use computerized distraction to repetitively unload the disc and facet joints with the goal of lowering intradiscal pressure, encouraging imbibition, reducing herniation and increasing disc height. Previous literature has not included decompression as a multimodal chiropractic regimen. Intervention and Outcome: The patient presented with lower back pain and right leg pain and paresthesia of 4 months duration that was worsening despite treatment with medication. He was treated for six weeks using nonsurgical spinal decompression, side lying chiropractic manipulation, back strengthening exercises, cryotherapy and low-level laser. Treatment was rendered in accordance with protocols taught at Parker University and the International Medical Advisory Board for Spinal Decompression. Pain was reduced from 10/10 VAS to 5/10 immediately following the initial treatment and decreased to 1/10 over the 6 week treatment plan. Lower extremity weakness resolved and the patient was able to return to normal activities. The therapeutic benefits were maintained at one month and at a six-month follow ups. Conclusion: Previous literature has not investigated spinal decompression in conjunction with chiropractic manipulation and low-level laser therapy. In this case, the patient had an excellent outcome. Further investigation is encouraged on this multimodal treatment approach. Lumbar disc herniation is a displacement of disc material (nucleus pulposus or annulus fibrosis) beyond the intervertebral disc space.1 Radiology is used to confirm diagnosis, with MRI as the preferred imaging modality. 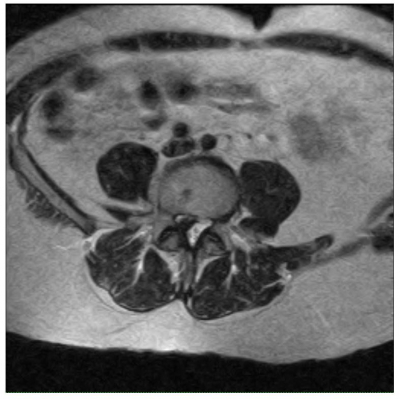 Evidence of a herniated disc on imaging must be correlated with clinical findings, as herniated disc may be present on MRI in asymptomatic individuals.2 In cases where MRI is contraindicated, spiral CT is the best alternative.3 Herniated discs are a common cause of lower back pain, hip, and leg pain. A review of the existing literature on non-surgical decompression using PubMed and the Index of Chiropractic Literature indicated that published studies to date have not described the use of spinal decompression in conjunction with traditional chiropractic methods or as part of a multimodal program. While traction modalities are broadly utilized in chiropractic and physical medicine, NSD is gradually gaining acceptance and is a common continuing education subject for chiropractic physicians. Shealy recommended decompression in conjunction with heat, ice, TENS, and myofascial release.15 NSD has been taught as a postgraduate certificate program at Parker University since 2012 as part of a multimodal treatment plan including chiropractic manipulative therapy (CMT) and electrical stimulation as needed to the decrease fixation and spasm prior to NSD and cryotherapy and low-level laser therapy post NSD to decrease inflammation. Patient care also includes therapeutic exercise and nutritional recommendations.6 Upon review of PubMed and the Index of Chiropractic Literature the author was unable to find literature concerning NSD as part of a multimodal treatment protocol. This case study describes the care of a patient with a 16 mm lumbar disc herniation using a multimodal NSD treatment plan. The author has obtained the patient’s written consent to publish this case report. A 59 year-old male presented with constant sharp lower back pain with radiating pain and paresthesia at the right lower extremity down to the foot in the L4 and L5 distribution, accompanied by tightness at the right hip. The pain was attributed to repetitive heavy lifting at his job doing apartment maintenance. Symptoms had been worsening for 4 months and did not improve with medication. He rated the pain 10/10 VAS. He reported difficulty sitting, driving and walking and reported that pain interfered with sleep. Previous care included evaluation by his primary care physician and orthopedic consultation. Hip radiograph and MRI were negative, prompting the primary care physician to order lumbar MRI. The patient reported the following medications: rosuvastatin calcium, metformin, glipizide ER, ramipril, and sitagliptin phosphate. His past medical history included surgery to the left knee. A review of systems revealed type II diabetes, which was controlled with medication. He reported a family history of diabetes in both parents. The patient was married and worked in property maintenance. He denied tobacco use. The patient was 71.5 inches in height and 235 lb. Blood pressure was 154/84 with pulse 66 and respiration 20. He was alert and oriented to person, time and place, with appropriate mood and affect. He appeared distressed due to pain. Examination of the peripheral vascular system, lymphatics, skin and CN II through XII was unremarkable. Minor’s sign was present. The patient’s posture was antalgic with a left lean. His gait was limping and movements were guarded. He ambulated holding onto a counter or wall for support. Lumbar active range of motion was markedly reduced in all movements due to pain. Valsalva’s maneuver was positive, eliciting lower back and right leg pain. Kemp’s test was negative on the left and positive on the right, producing increased low back and right leg pain. Straight leg raise was positive. Well leg raise was negative. Trendelenburg’s test was positive, indicating right gluteal muscle weakness. The patient was unable to heel walk, with foot drop on the right. Dermatome testing by pinwheel at the lower extremities was normal. Lower extremity motor was grade 5/5 on the left. There was right lower extremity weakness in dorsiflexion (grade 3/5) and inversion (grade 4/5), with plantar flexion and eversion strength grade 5/5. There was paraspinal muscle spasm at the lumbar musculature and right gluteal muscles. Deep tendon reflexes were grade 2+ at the patellar and Achilles tendons on the left and grade 1+ at the patellar and Achilles tendons on the right. There was tenderness to palpation at the spinous processes of L3-L5, sacrum and at the right sacroiliac joint. There was palpable asymmetry and restricted motion at L3-L5, sacrum and right ilium. MRI study of the lumbar spine done the day before the patient presented was reviewed. Moderate degenerative disc disease was present at L2-L3. There was moderate to severe disc degeneration at L3-L4 with a 16 mm right-sided disc herniation compressing the right side of the thecal sac and right L4 nerve root. Mild L3-L4 central canal stenosis was present. Severe disc degeneration and moderate bulge was present L4-L5, resulting in bilateral neuroforaminal stenosis. The patient was diagnosed with lumbar disc displacement, right L4 and L5 radiculopathy, and segmental dysfunction of the lumbar and sacroiliac areas. The treatment schedule consisted of 20 visits over 6 weeks, as follows: 5 times per week for 2 weeks, 3 times per week for 2 weeks and 2 times per week for 2 weeks. Side lying CMT was applied to L3 using a mamillary process contact and to the right SI joint when indicated by palpation. NSD was used to treat the L3-L4 level (Disc Force™ IDD Therapy® by North American Medical corporation). The starting tension was 25% body weight (54 lb) at 15 degree angle for 25 minutes. Cold pack and low-level laser therapy (Microlight ML830 830 nm 100 mW) were applied to the lower back following decompression. Home exercises to improve flexibility and strength were added to the treatment program as soon as tolerated (the 4th visit). He was given home care instructions to avoid lifting and bending, apply ice, supplement with 1000 mg fish oil three times per day to reduce inflammation, and drink 64 oz water per day. Tension was gradually increased to 50% body weight (117 lb) as tolerated. The initial treatment resulted in an immediate reduction of pain by 50% (from 10/10 VAS to 5/10 VAS). With the exception of one day of exacerbation after sleeping awkwardly, pain intensity and activities of daily living progressively improved. At each visit, the patient reported reduced pain following decompression therapy. Sleep improved significantly following the first treatment and the patient was able to sleep through the night with interruption after one week of care (five visits). The patient was able to return to work after three visits with the restriction to avoid lifting more than 20 lb for two weeks. He was able to walk better after three treatments and he reported being able to walk straight for the first time in three years after one week for care. At the conclusion of 6 week treatment plan the patient was nearly pain free (1/10 VAS), he was able to walk normally, with no antalgia, and lower extremity motor was 5/5 bilaterally. At a one-month follow up, the therapeutic benefits were maintained, with no complaints except mild back and leg tension and discomfort with driving more than 1 hour At a six-month follow up, the patient was free of symptoms despite having resumed strenuous lifting at his job. T2 weighted non-contrast sagittal lumbar MRI showing a 16mm L3-L4 herniated disc. Axial lumbar MRI: L3-L4 disc herniation. 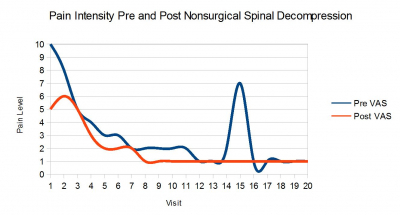 Pain intensity progressively improved during nonsurgical spinal decompression therapy. The patient experienced one day (visit 15) of increased pain after sleeping in an awkward position but pain decreased post treatment that day. Criticisms of nonsurgical spinal decompression have focused on the lack of evidence in the form of randomized controlled trials and cost of treatment.16 Schimmel et al performed a single-blinded randomized controlled trial of IDD Therapy by comparing two groups of back pain sufferers. Both groups were treated with standard graded activity, with one group receiving IDD Therapy and the other a sham (accomplished by using a negligible amount of distractive force). Finding no difference between the two groups, the authors concluded that NSD was of no benefit.17 A randomized trial compared interferential to mechanical traction and massage and found both groups had progressive back pain relief and improvement in Oswestry scores but with no significant difference between the groups.18 Fritz and colleagues suggested that there may be a subset of back pain sufferers who are likely to benefit from traction.19 The author proposes that NSD is appropriate for patients with spinal pain and significant signs and symptoms of radiculopathy or who have failed to improve with other conservative measures. NSD is recommended, as part of a multimodal chiropractic treatment plan, as a safe and cost-effective option compared to injections or back surgery. Viewed in this context and due to the inherent difficulty in providing a sham with a physical intervention the author encourages long term patient centered outcomes studies comparing NSD to surgical intervention. The author acknowledges that the natural history of herniated discs is often good regardless of treatment. However, in this case the patient's condition was chronic and worsening upon presentation but he experienced immediate improvement following the initial treatment. Pain, antalgia, paresthesia and weakness progressively improved within the 6 week treatment plan. The author suggests that rather than trying to isolate which intervention had a beneficial effect, future investigation should evaluate optimal dose and identifying which cases are most likely to improve with this multimodal approach. Further research is encouraged on NSD as part of a multimodal treatment plan for discogenic pain at a significant reduction in cost and risk as opposed to surgery. The author wishes to thank Eric Kaplan, DC, FIAMA, postgraduate continuing education instructor, Parker University, National Decompression Certificate Program, and co-chairman of the International Medical Advisory Board on Spinal Decompression for the development of NSD as a multimodal chiropractic treatment plan. 1. Fardon DF, Williams AL, Dohring EJ, Murtagh FR, Gabriel Rothman SL, Sze GK. Lumbar disc nomenclature: version 2.0: Recommendations of the combined task forces of the North American Spine Society, the American Society of Spine Radiology and the American Society of Neuroradiology. Spine J. 2014 Apr 24. 2. Borenstein DG, O'Mara JW Jr, Boden SD, et al. The value of magnetic resonance imaging of the lumbar spine to predict low-back pain in asymptomatic subjects. J Bone Joint Surg Am 2001;83-A:1306–1311. 3. Parker SL1, Xu R, McGirt MJ, Witham TF, Long DM, Bydon A. Long-term back pain after a single-level discectomy for radiculopathy: incidence and health care cost analysis. J Neurosurg Spine. 2010 Feb;12(2):178-82. 4. NHS Choices: Lumbar decompression surgery – Risks [Internet]. United Kingdom: National Health Service; 2015 Aug 11 [cited 2015 Aug 18]. Available from: http://www.nhs.uk/Conditions/Lumbardecompressivesurgery/Pages/Risks.aspx. 5. Papadakis M, Aggeliki L, Papadopoulos EC, Girardi FP. Common surgical complications in degenerative spinal surgery. World J Orthop. 2013 Apr 18; 4(2): 62–66. 7. Ramos G, Martin W. Effects of vertebral axial decompression on intradiscal pressure. J Neurosurg. 1994;81:350–353. 8. 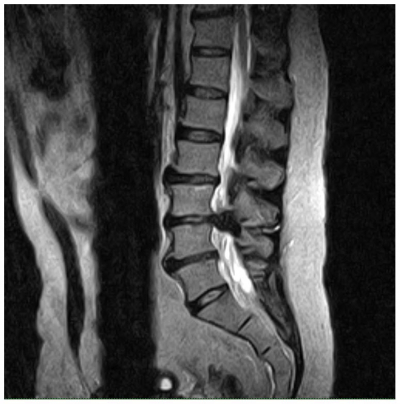 Eyerman E. MRI evidence of nonsurgical, mechanical reduction, rehydration and repair of the herniated lumbar disc. J Neuroimaging. 1998; 8(2). 9. Ottenstein A. Distraction Techniques for Lumbar Pain. Pract Pain Manag. 2003 Mar-Apr. 10. Apfel et al., Restoration of disk height through non-surgical spinal decompression is associated with decreased discogenic low back pain: a retrospective cohort study. BMC Musculoskelet Disord. 2010 Jul 8;11:155. 11. Gundersen B, Henrie M. Five year follow-up on the clinical trial on non-surgical spinal decompression using vertebral axial distraction delivered by a computerized traction device. J Acad Chiropr Orthoped (JACO). 2010 Mar;7(1):3-7. 12. Shealy N, Borgmeyer V. Decompression, reduction, and stabilization of the lumbar spine: a cost effective treatment for lumbosacral pain. Am J Pain Manage. 1997;7:63–65. 13. Shealy N, Koladia N,Weseman M. Long -term effect analysis of IDD therapy in low back pain: a retrospective clinical pilot study. Am J Pain Manage. 2005;15:93–97. 14. McClure D, Farris B (2006) Intervertebral Differential Dynamics Therapy—a new direction for the initial treatment of low back pain. Eur Musculoskeletal Rev 1:45–47. 15. Shealy N. Technology Review. Pract Pain Manag. 2005 Apr 1. 16. Daniel DM. Non-surgical spinal decompression therapy: does the scientific literature support efficacy claims made in the advertising media? Chiropr Osteopat. 2007 May 18;15:7. 18. Werners R, Pynsent PB, Bulstrode CJ. Randomized trial comparing interferential therapy with motorized lumbar traction and massage in the management of low back pain in a primary care setting. Spine. 1999;24:1579–1584. 19. Fritz JM1, Lindsay W, Matheson JW, Brennan GP, Hunter SJ, Moffit SD, Swalberg A, Rodriquez B. Is there a subgroup of patients with low back pain likely to benefit from mechanical traction? Results of a randomized clinical trial and subgrouping analysis. Spine (Phila Pa 1976). 2007 Dec 15;32(26):E793-800.